Rep. Mike Rogers: there's no proof that the attack on the consulate in Libya was related to protests over an anti-Islam video. The chairman of the House Intelligence Committee said Sunday there's no proof indicating the attack on the consulate in Libya, which killed U.S. ambassador Chris Stevens and three other Americans, was related to protests over an anti-Islam video. "I have seen no information that shows that there was a protest going on as you have seen around any other embassy at the time. It was clearly designed to be an attack," Rep. Mike Rogers told CNN's "State of the Union." Rogers said the administration's statements have been "confusing," criticizing President Barack Obama for attending a campaign event in Colorado the night after the attacks. "This is as serious an event as I have ever seen, and it's been confusing to try to follow where the administration has been. I'm disappointed the president didn't say, 'I'm not going to the fund-raiser. I am going to go on national TV and put this right,'" he said. 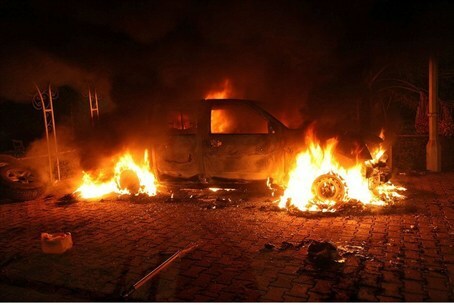 The intelligence sources cited by Fox News over the weekend said the attack on the American consulate in Benghazi had clearly appeared to be a pre-planned, “coordinated assault” by some 100 operatives. The attack came in two waves, according to the sources, who confirmed earlier reports that rocket-propelled grenades (RPGs) and mortar shells were fired at both the consulate and the “safe house,” and apparently with the assistance of an insider. A video which surfaced last week and which some news outlets claimed had showed Libyan men trying to save Ambassador Stevens as his body is recovered from the U.S. Consulate in Benghazi, turned out to show the opposite. In fact, an alternative translation provided to Infowars by a native Arabic speaker, showed that the men were celebrating the fact that Stevens is dead.